The report comes at a time of rising anxieties in the U.S. about a jobless economic recovery, and new reports showing that over 85 percent of President Obama's economic stimulus clean tech grant program went to foreign firms. Recently Senator Chuck Schumer (D-NY) wrote to Department of Energy Secretary Steven Chu opposing a $1.5 billion Texas wind farm to be built with Chinese turbines. 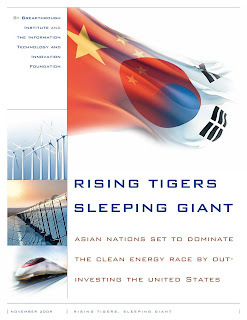 In response, China's A-Power Generation Systems wind manufacturer announced plans to open a factory in the U.S.
"Rising Tigers, Sleeping Giant" is the first report to comprehensively benchmark clean energy competitiveness and government investments in cleantech by China, Japan, South Korea, and the United States. These Asian governments will invest $519 billion in clean technology between 2009 and 2013, compared to $172 billion by the U.S. government. Climate and energy legislation, which passed the House in June, would contribute $28.7 billion of the $172 billion five year total. China alone will spend $440 billion to $660 billion over the next ten years on clean tech. Indeed, the United States' traditional prowess in attracting venture capital and other private funding could soon be eclipsed by Asia. China and other Asian nations, the report concludes, are offering a better business and investment climate than the United States. And China's share of private sector clean tech funding is growing rapidly. Between 2000 and 2008, the United States attracted $52 billion in private capital for renewable energy technologies, but China alone attracted $41 billion. China secured more private investment in renewables and efficiency technologies than the U.S. for the first time in 2008. Investment bank giant Deutsche Bank recently concluded that "generous and well-targeted [clean energy] incentives" in China and Japan will create a low-risk environment for investors and stimulate high levels of private investment in clean energy because those nations rely on a "comprehensive and integrated government plan, supported by strong incentives." In contrast, Deutsche Bank says, the United States is a "moderate-risk" country since it relies on "a more volatile market incentive approach and has suffered from a start-stop approach in some areas." "While some U.S. firms will benefit from the establishment of joint ventures overseas," the report warns, "the jobs, tax revenues, and other benefits of clean tech growth will overwhelmingly accrue to Asian nations." New pollution regulations, a national renewable energy standard, and efficiency regulations in the U.S. will not, the report finds, be sufficient to close the technology investment gap between the US and Asia. New climate pollution regulations will not be strict enough to send much private investment to clean technologies, and large infrastructure barriers such as the need for new transmission lines stand in the way of greatly expanding solar and wind. Michael Shellenberger is the President and co-founder of the Breakthrough Institute and a co-author of "Rising Tigers, Sleeping Giant."